Large Easter Bunnies Basket Boxes 10-1/4x6x7-1/2"
Buy More Special Occasion Basket Boxes Save More! 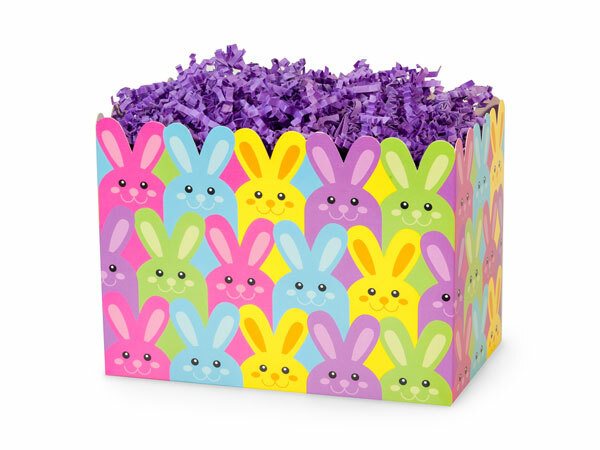 Large Easter Bunnies Basket Boxes feature colorful Easter bunnies and die cut top edge. Makes adorable Easter bunny gift baskets! Special Occasion design basket boxes store flat and are a unique and inexpensive alternative to bulky gift baskets. Combine with our shred and basket-sized cello bags for the perfect gift basket. They also make great table centerpieces for parties. Sturdy reusable boxes. We recommend our C2030BC cello bags for Large basket boxes & C14BC cello bags for Small basket boxes.